We traditionally enjoy a delicious breakfast in our house on Christmas morning. After all, odds are if you have little ones you'll be up at the crack of dawn anyway! There were some delicious ideas floating out there that I thought I'd share. 1. Cinnamon always reminds me of Christmas for some reason. 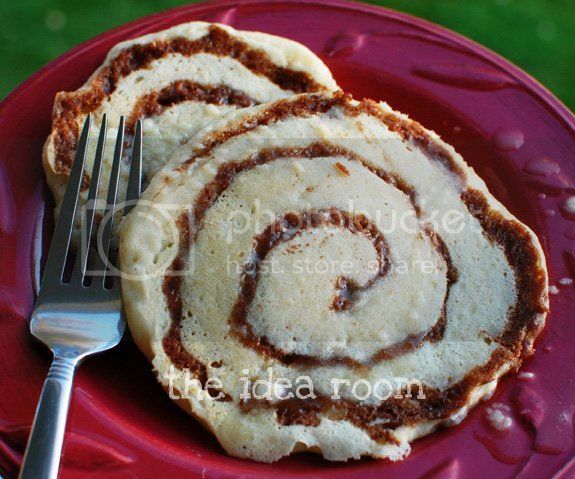 So these cinnamon swirl pancakes from the Idea Room would be perfect (and pretty!). And to complement those pancakes, some brown sugar bacon would be divine! I didn't think bacon could be improved upon, but it looks like that might be the case with these instructions from Babble. 2. Or how about dessert for breakfast? It's Christmas after all! 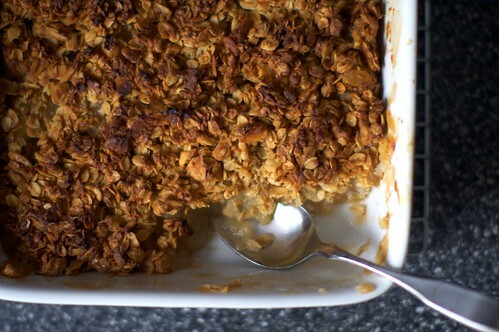 I'm thinking this breakfast apple granola crisp from smitten kitchen would be fantastic! 3. 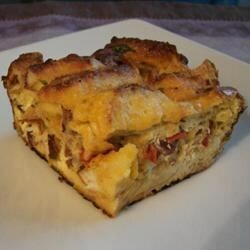 If savory is more your breakfast deal, this Bacon Tomato and Cheddar Breakfast Bake with Eggs recipe from Noble Pig has been haunting me. How beautiful is this breakfast? 4. Our usual Christmas morning fare is a batch of easy caramel rolls that rise overnight. Here's a recipe for easy overnight caramel rolls from the Tasty Kitchen site. (sorry, no pic). 5. But this year, we are trying something different! We are planning to make this Bagel and Cheese Bake, which can be prepped the night before! YUM! We'll let you know how it turns out. So, I'm curious. Do you have any Christmas breakfast recipe traditions? We always have biscuits and gravy Christmas morning. But I might have to try a couple of those recipes in the next week or so. They sound delish!